Soak up a memorable Lake break! Boasting a fabulous holiday setting on Lake Monate, this child-friendly 1 bed apartment offers a private dining garden, shared pool access and close proximity to the lake beaches! Lake Monate is a true gem in the Italian lake region, offering an idyllic (as well as convenient) setting nestled between the tourist highlights of Lake Maggiore. This lovely 1 bed ground floor apartment offers a spacious and accessible holiday layout; perfect for a couple or group of 3 looking to stay. The spacious open plan living room with terrace and garden access also benefits from a stylish interior, WIFI access and a SAT flat screen TV. The accompanying kitchen diner is ideal for enjoying relaxed holiday meals in too, and is complemented by a lovely round dining area, an intimate breakfast bar for 2 and access to the outdoor covered dining terrace with BBQ. Perfectly suited for romantic breaks, the Master Double bedroom is a great size and offers a little and private garden. Small families looking to stay will be able to make the most of the baby cot hire and also the single bed facility, which features in the hallway between the living room and main bedroom. A modern shower room and private laundry facilities complete this inviting, carefree holiday retreat. Located in the authentic town of Travedona Monate, guests can enjoy authentic dining at one of the many local pizzerias and lake restaurants, as well as timeless days spent swimming in the clean water, taking out a pedalo and simply relaxing amongst nature, at one of the popular lidos which is situated less then one kilometre from Casa Maria Grazia. Outside, the modern residence boasts sunny shared grounds with an outdoor swimming pool that opens the 1st of May and closes the 6th of September and close proximity to public parking and the ‘L’Ultima Spiaggia’ lakeside lido (7 minutes' drive away). The pretty authentic town is well-situated; with Lake Maggiore and its attractions just 10-15 minutes’ drive away, and the cosmopolitan Swiss lake city of Lugano 64 minutes’ drive away. With so much on offer for year-round stays, come and soak up both beauty and fun, with this well-placed holiday home! The flexible 1 bed retreat can perfectly accommodate a couple or a small group of 3. Situated in a sunny family-friendly residence, guests can easily enjoy soaking up some sun! The shared outdoor pool (used by 30 apartments in all) offers the perfect excuse to enjoy a classic holiday moment, whilst the pair of sun loungers and private alfresco dining terrace/garden offer a tempting moment’s relaxation. Please note 2 sun loungers are also provided for guests use by the poolside. Pool caps are provided in the apartment and must be used. 1 private parking space features within the gated residence. The modern family-friendly residence boasts a relaxed holiday feel, being located in a quiet backwater setting along a secondary road in Travedona Monate. The authentic and friendly village is home to a local bakery, a selection of cafes and a pharmacy, whilst supermarkets are within easy reach, 7 minutes' drive away. Very close by the lakeshore, the holiday home enables you to easily get out and enjoy the main local lake beach of ‘L’ultima Spiaggia’, also just 7 minutes’ drive away. Here you can enjoy the sun loungers, pedalos, on-site restaurant and bar, all from the lovely appeal of its lake garden setting. Grown-ups can also savour a cheeky aperitif, whilst children enjoy swimming and playing in the pristine lake water. Nearby, keen golfing fans can also tee off at the Golf dei Laghi club. Monate Lake offers a truly idyllic backdrop for your holiday stay. A gem in the local lake region, its peace and tranquil ambience comes from only allowing rowing boats on its water. The serene natural setting is complemented by a plethora of lake beaches, lidos and authentic pizzerias and restaurants which overlook the lake. Situated just 10 minutes’ drive away from Lake Maggiore, guests can also enjoy easy access to the Lake Maggiore towns of Angera (home to Rocca di Angera castle and a lovely lake beach) and also Ispra (for the DK Summer Club, Active Sport day excursions and array of authentic bars and restaurants), both 12-16 minutes’ drive away. The famous ‘Hermitage di S.Caterina del Sasso’ in Reno di Leggiuno and the Parco della Quassa and venue hire centre at Villa Quassa are all within easy reach too, just 15 minutes’ drive away. 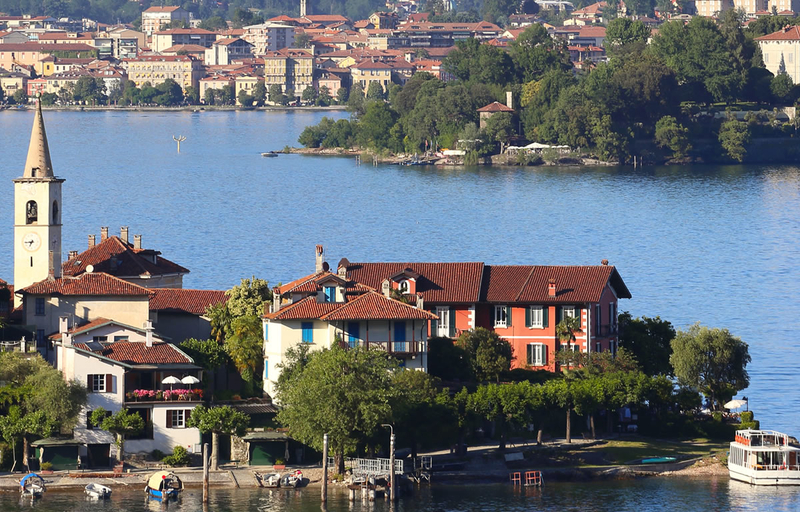 The perfect base for exploring the wider Lake Maggiore region, Laveno-Mobello (25 minutes’ drive away) offers ferry trips across to the famous Borromean Islands and also the elegant lake towns of Intra and Pallanza. Conveniently placed for year-round breaks, guests are just 33 minutes’ drive from Milan Malpensa airport and 64 minutes’ drive from the cosmopolitan Swiss city and airport connections of Lugano.